Deck mount Shower Enclosure Set w/7-inch center British Telephone Faucet and Brass/Porcelain Shower Head. 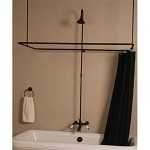 Shower riser is 5/8-inch outer diameter solid brass heavy gauge 2-piece riser. 5-foot Total height, extends 9-inch horizontally. 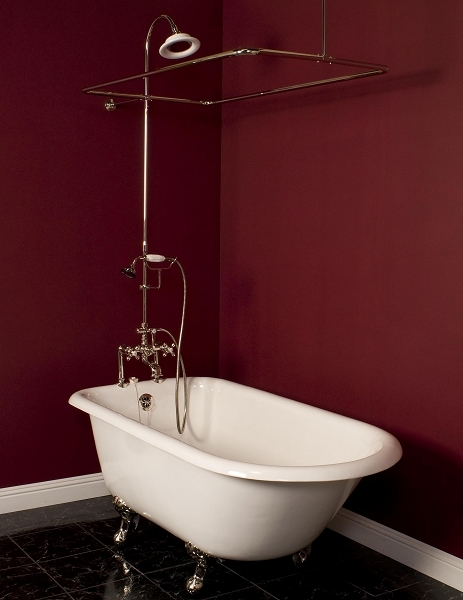 Includes fitting for 1/2-inch iron pipe size shower head. Enclosure is 3/4-inch outer diameter solid brass heavey gauge tubing with adjustable 36-inch and 12-inch wall braces with 1/2-inch outer diameter. This enclosure is available in two sizes: 45-inch x 25-inch or 57-inch x 31-inch.